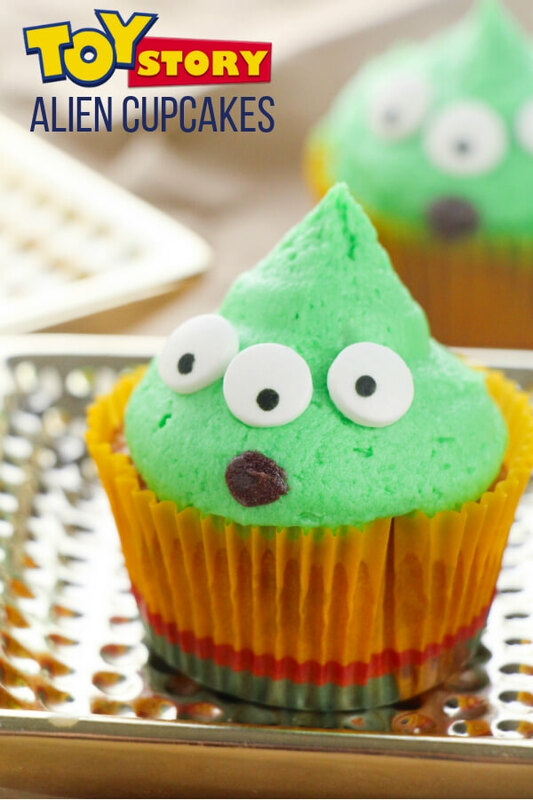 Inside: Super cute and super easy Little Green Alien Cupcakes inspired by the movie Toy Story! 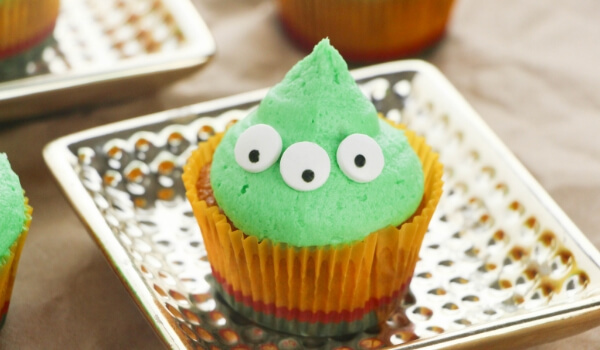 Family movie nights are a tradition in this house and one of the best desserts for family movie night is a themed cupcake with homemade buttercream – it’s just so versatile. 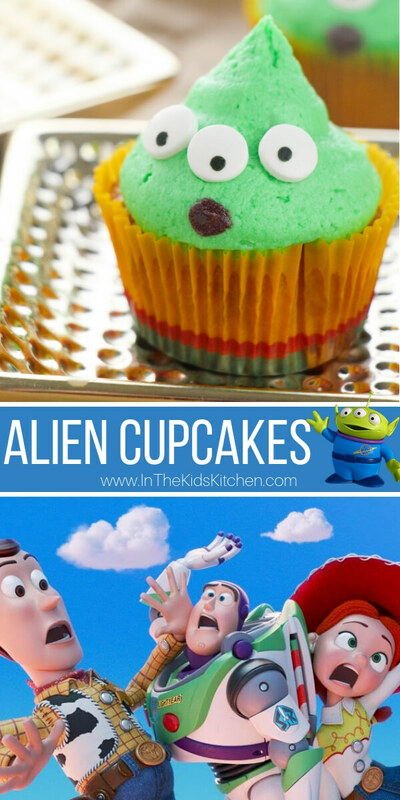 Themed cupcakes do not have to be complicated, as today’s super cute Toy Story Cupcake Aliens prove! I showed my daughter the new trailer and now we’re having a Toy Story 1-3 marathon this Friday. Sounds good to me! 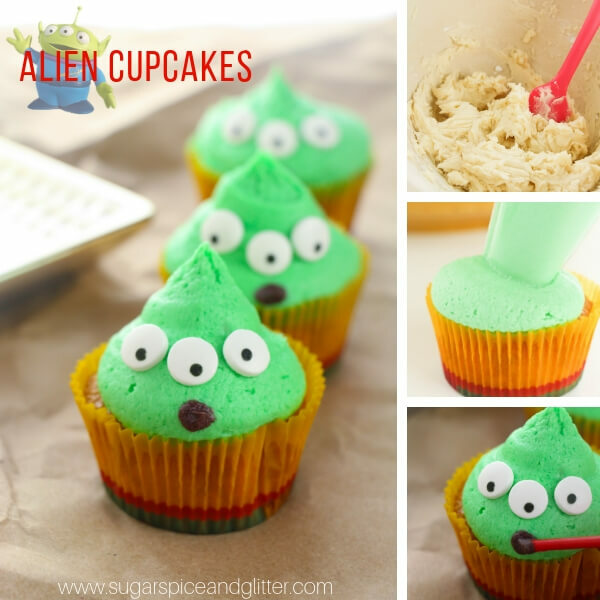 To go along with our Toy Story Family Movie night, I whipped up these super simple Toy Story Alien Cupcakes. 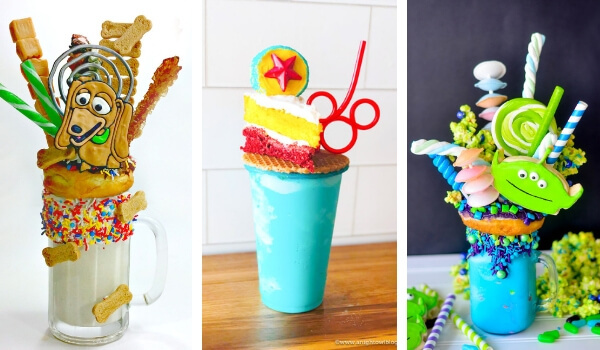 These would also be super cute for a Toy Story party. Now, I’m going to be honest with you – I do boxed cupcakes 90% of the time. Unless I’m going for some special flavor or it’s for a really special occasion, boxed cupcakes work perfectly fine for me. But I draw the line at canned frosting. That’s a NOPE from me. Once you’ve made your own buttercream frosting and realize just how freaking easy it is, you will never ever go back to canned frosting. Homemade buttercream makes your cupcakes taste like they came from a bakery and they make up for any shortcuts you may have taken with the actual cupcakes. 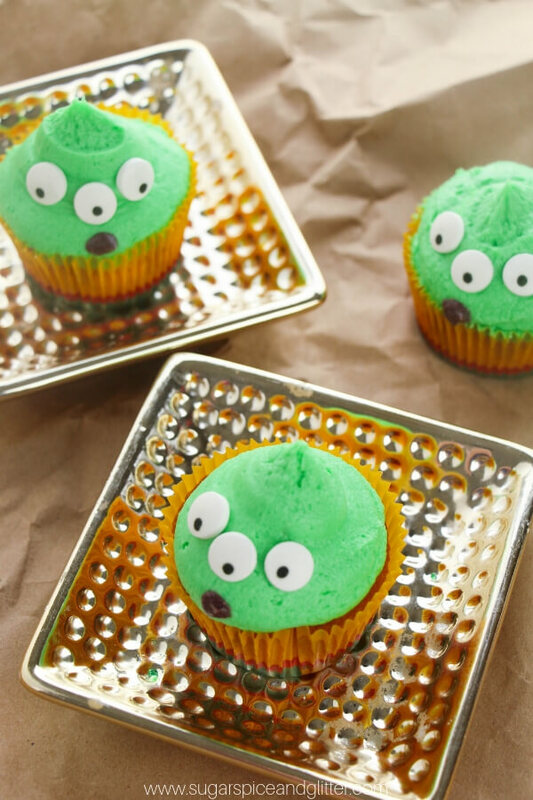 I hope your kids love these super cute alien cupcakes – be sure to tag us on social if you make them! Tip: swap out the vanilla extract for your preferred flavor extract. Prepare the boxed cupcake mix as directed on box. Allow to cool completely before frosting. Add remaining icing sugar 1/2 cup at a time until you reach your desired consistency. Add green food colouring to color preference. Reserve about 2 Tablespoons of the frosting into a small bowl for the mouths. 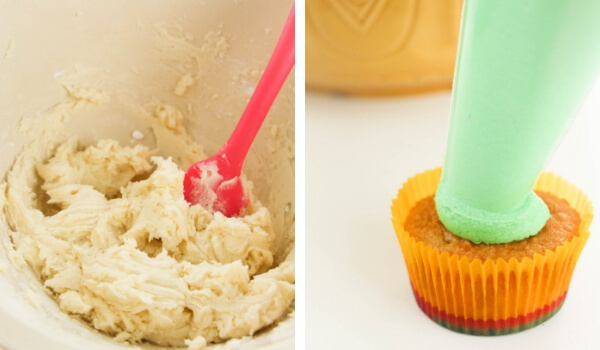 Pipe the frosting onto the cupcake by placing the tip of the piping bag onto the center of the cupcake and applying even pressure to apply a generous dollop of frosting. 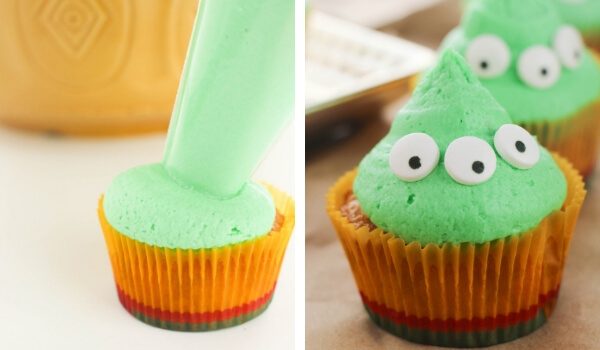 I like this effect for the aliens rather than swirling on the frosting. 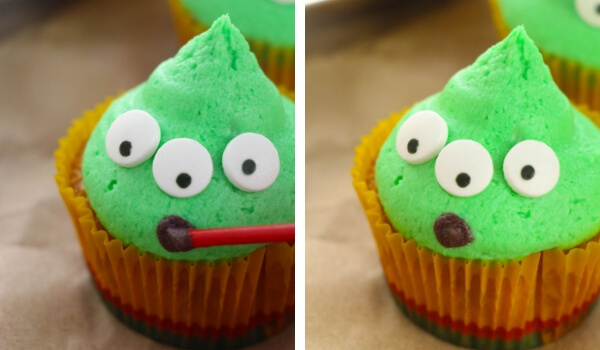 Apply three eyes in a slight curve, and then dye the reserved frosting black and add dabs of it to each alien for the mouth. 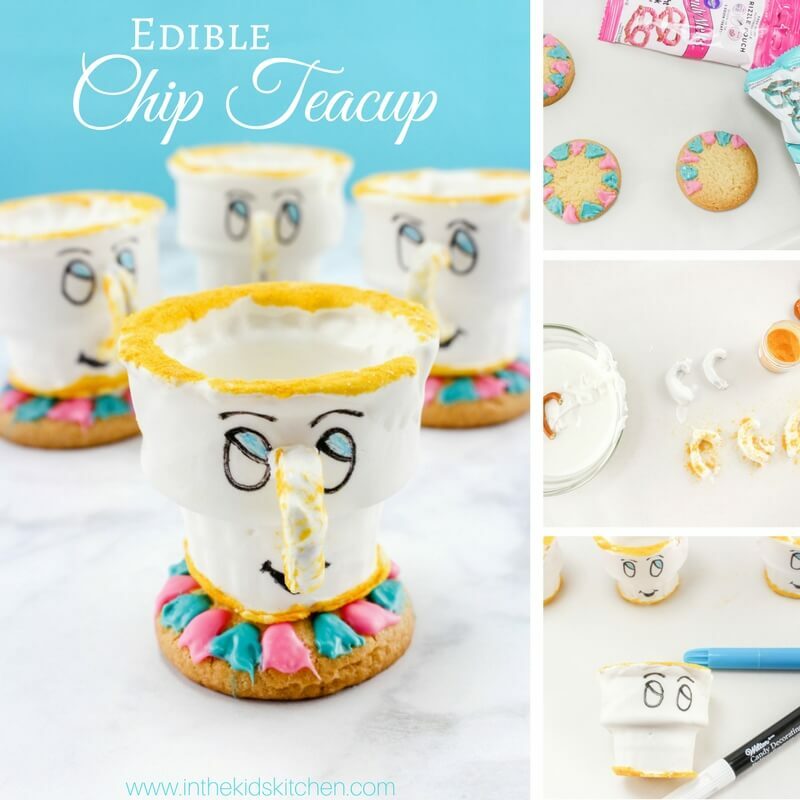 Will you be trying out this recipe for your family’s Toy Story movie night? 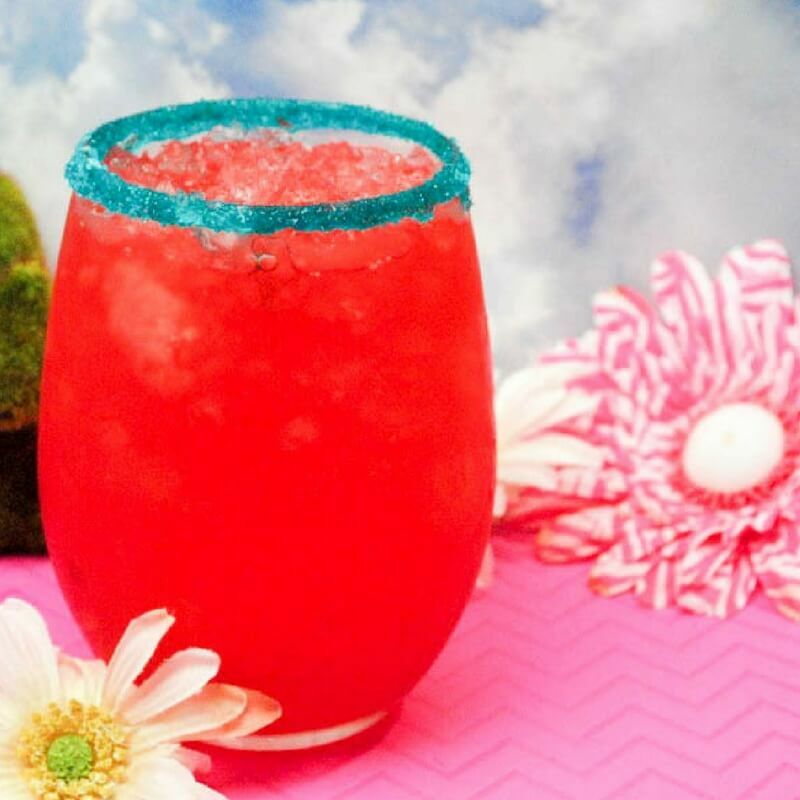 Be sure to check out some of our other fun Disney desserts, like our Edible Chip Teacups or our Moana Hawaiian Punch Recipe.